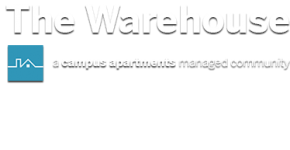 The Warehouse has fully furnished apartments. Rent includes water, trash, sewer, cable, internet, and a portion of your electricity. You will also have access to our rooftop lounge, newly updated fitness center, study center with free WiFi printing & more! Yes, Warehouse allows cats and dogs! All furry roommates must be registered and approved through the office. There is a weight limit and modest pet fees apply. Contact us for more details! Warehouse is located about 3 blocks from campus so most residents choose to walk or bike to class! The community is also located near a few prime Chapel Hill Transit bus stops. Warehouse offers assigned parking to residents at a premium. Parking types include outside single or stacked and garage single or stacked spaces. Warehouse does not have guest parking available. Rent is due on the 1st of every month; however there is a grace period until the 5th. On the 6th, rent is considered late and subject to a fine. For your convenience, you can pay online via the property’s website (click on PAY RENT under the RESIDENTS section of our website) using a debit/credit card, set up an automatic withdrawal, Echeck, or pay with a check or money order at the Leasing Office. No cash is accepted. Submit a Service Request online using the Resident Portal. (click MAINTENANCE under RESIDENTS on the website to set up an account). Follow the prompts to complete the service request. Call the office and speak with a Campus Apartments team member or leave a message if your call is after the office is closed. Warehouse offers fully furnished apartments which includes a sofa, side chair, coffee table, end table, entertainment center, and dining table with seating for four in the common areas. Bedrooms are furnished with a desk, desk chair, four-drawer dresser, and full size bed. Our apartments come with fully equipped kitchens that include refrigerators with ice makers, self-cleaning ovens, dishwashers, and mounted microwaves. Each unit also includes a stackable washer and dryer.